This entry was posted in Training & education on 2015/11/12 by Susan. Employers and supervisors are responsible for the safety of workers who drive during their shifts. During the winter months, workers need to take extra precautions when roads get cold and slippery. Here in British Columbia, the number of crashes in which someone is killed or injured due to driving too fast for the conditions almost doubles from October to December – up from 114 in October to 222 in December. This includes crashes in which the driver is working. On average each year, 24 workers are killed, and another 1,315 are injured and miss time from work due to work-related motor vehicle incidents. 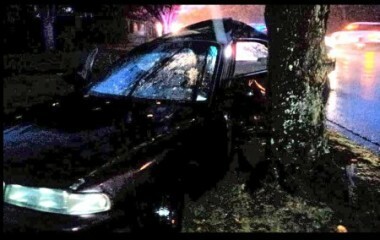 This is a recent pic from a Facebook friend of mine who crashed into a tree after hydroplaning on a wet, oily road. He gave me permission to use it for this post, from his bed in hospital where he was recovering from broken ribs and a collapsed lung. The Winter Driving Safety Course is a free, online resource that helps employers create a winter driving safety plan for their workforce. It takes about one to three hours and you can do it in spurts or all at once, says Joanna Wyatt, program director of Road Safety at Work, whose team works with the Winter Driving Safety Alliance. The Alliance is a joint provincial initiative supported by organizations committed to improving the safety of drivers during the winter months. The new course uses all the tools in the Employer Toolkit, created by partners of the Shift into Winter campaign. Thanks to Joanna for talking with me about the course – and congratulations to the Justice Institute of BC for winning two Horizon Interactive Awards for their work on the course. These annual awards recognize and promote the best websites and other electronic communications, with thousands of entries from around the world.